What makes a wedding beautiful? It's design ofcourse! Think about the times when you attended a wedding or event, and you walked into a room that completely dazzled you with its incredible decor and ambiance. Well, let me tell you...A LOT of thought, planning, and hard work went behind the scenes to pull it all together. 1. How do you hone in on a concept that truly expresses your passions, style, personalities, and background? 2. How do you take one, or even multiple, ideas and turn it into a concept for your wedding design? 3. How do you thread elements of the concept throughout your wedding to make the design cohesive and perfect? The Wedding University will be offering a design class for its students to help them understand the basic elements of design-- how to turn an idea into a design concept, and then how to turn the concept into reality! One of the professors for the design class will be Gloria Wong Tritasavit of Sash and Sugar. Gloria has a background in design and is obsessive about color, composition, style, and how visual elements can stir the heart. Born and raised in San Francisco, she set her sights on a career in fashion at an early age. After receiving a Fine Arts degree with an emphasis in fashion design from the renowned Academy of Art College in San Francisco, she started her career in fashion by designing for DKNY Jeans in New York. She later ventured into merchandising at bebe, and then took on a role as a designer at Levi Strauss & Co in San Francisco. Upon planning her own wedding in 2006, Gloria fell in love with the world of event design and soon converted her creative energies from apparel to weddings. She earned her ACPWC certificate for wedding consulting and in the short amount of time she has been in business, her incredible designs have already been featured in numerous publications such as Brides, The Knot, SF Brides by Modern Luxury, Bride & Bloom, Style Me Pretty, Daily Candy, and the View From The Bay. 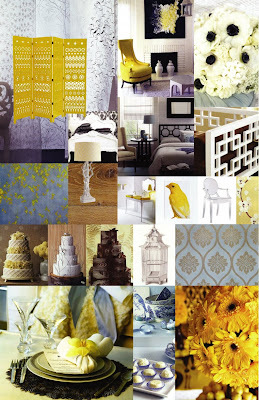 Take a look at this Mood Board that Gloria created for one of her clients this year! The couple's favorite destination for travel was France. They got giddy when they spoke of French shops to Gloria so she immediately knew that the wedding would be heavily influenced by French design. At the same time, the bride had mentioned her fondness for Asian styling and the groom expressed his desire to keep the wedding modern and organic. Both wanted a fresh bold color palette. The result was a Modern Chinoiserie concept equipped with French tapestry, Asian geometric shapes, birds and branches, and a daring color palette of bright lemon yellow, silvery blue, black, and white! - She is a Brady Bunch fanatic. - Her mother is one of twelve siblings. - She won an art contest sponsored by Sanrio when she was 8. - She met her best friend of 27 years and in Kindergarten, went to grammar school, high school, and college together, and were post-college roommates in New York.